Home Handmade cards Which Handmade Card? 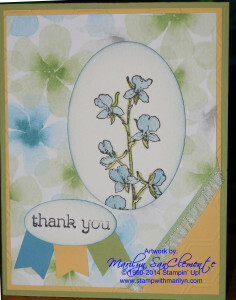 This is a card that I designed for a card swap that I was in last week for products from the new Occasions catalog. But I couldn’t decide which card I liked better! The background of the card is Pear Pizazz with a layer of So Saffron card stock embossed with the honeycomb embossing folder. The designer paper is Watercolor Wonder from the Occasions catalog. The stamp set is Happy Watercolor. I love this watercolor designer paper. The flowers are stamped on watercolor paper since I wanted to do some coloring with an aqua painter. When I am coloring, I like the look of the watercolor paper better and the way the color is absorbed into the paper. The floral image is cut using the oval framelits. The stamped piece was getting lost on the watercolor paper so I decided to sponge around the edge of the watercolor paper with marina mist. This helped to make the image pop on the card. 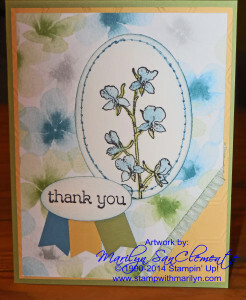 The banners under the thank you are punched out with the Sale-a-bration banner punch from marina mist, so saffron and pear pizazz card stocks. The diagonal bottom edge of the card is layered with pistachio pudding Ruffled Trim. So as part of the design process, I always try out different ideas before I decide on a final layout for a card. With this card I couldn’t decide if the sponging along the edge of the oval gave it enough of a contrast to the watercolor designer paper. 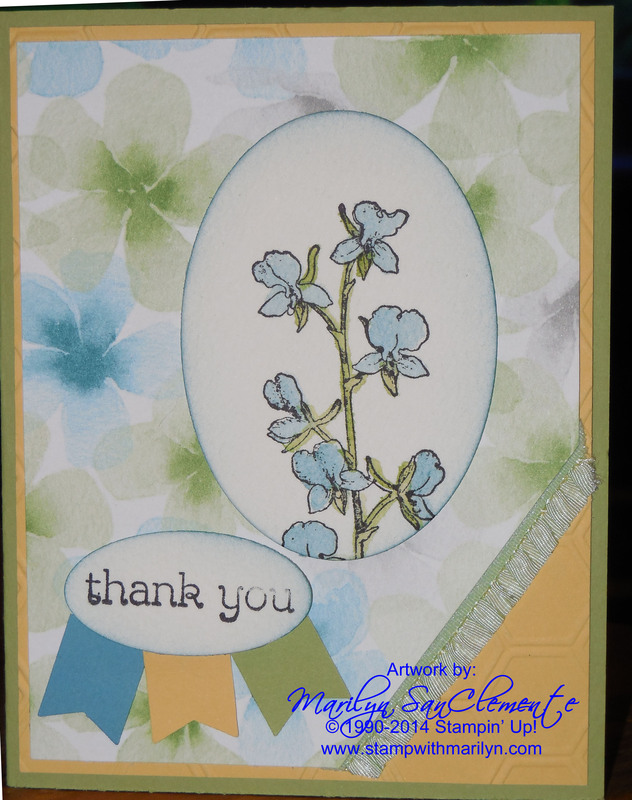 So on this card, I tried using the paper piercing tool to outline around the edge of the oval with some faux stitching. I used a marina mist marker to outline the blue faux stitching. So which card do you vote for?? I vote or the faux stitching. I had to scroll back and forth to see if that was the ONLY difference. The first version with inked edges are nice & soft, but after seeing the option of faux stitching it looks sort of incomplete. I have yet to use my piercing pack, thanks for the ideas!